12th International ’Daughters of the Moonlight’Belly Dance Competition for Duets and Groups! 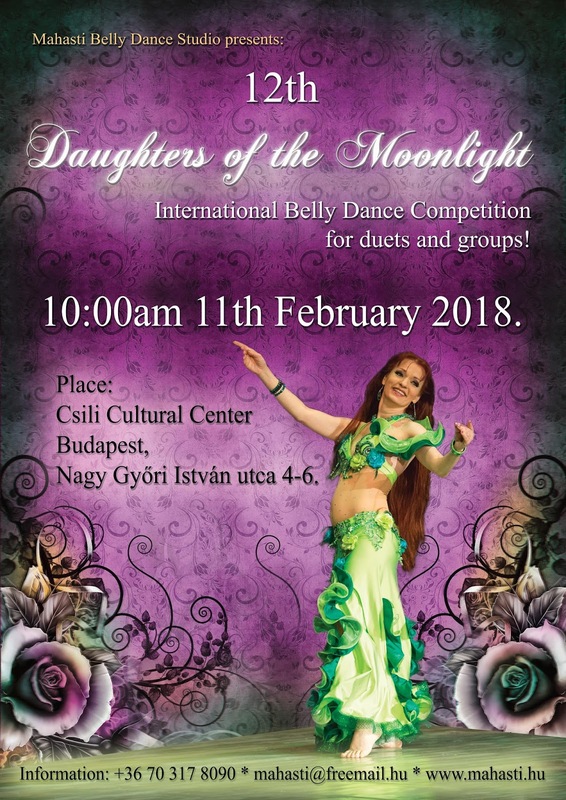 This is the one and only Hungarian belly dance competition exclusively for groups in the past 16 years. The category is for groups consisting of at least 5 pre-advanced amateurs exclusively. There’s no maximum of members, groups attending with more than 10 persons receive an entry fee discount! Those choreographies can also be entered here with which runner-up positions have already been won by the groups in pre-advanced and advanced categories. Of course, it is neither a requirement nor a reason for exclusion. Professional category (e.g. to make room for fresh advanced groups, or because their skills have surpassed the advanced category). The number of duets/groups can only be maximum 45. The entries are processed according to the order of application unless the quota is reached by the number of contestants (i.e. if the 45 groups apply until the 30th of January, the entry is closed by that day). - sending the music via email until the 30th of January (in a format of MP3). - 1 ticket for free, with which she can invite her friends, family, cheering people. Of course, more tickets can also can purchased at a discount price. The tickets include a slip with which the audience can vote on their favourites and a voucher with which you can receive services for discount prices. - Personally, at the instructors of Mahasti Belly Dance Studio. Exceeding time is only allowed for 10 seconds maximum. After 10 seconds, the person in charge will mute the music! Registration of the contestants is at the desk by the main entry from 09:15. The order of performances will be available on www.mahasti.hu, on https://www.facebook.com/events/1292021220874297/ at FB Events, and will also be sent via e-mail to the representatives of the groups. An announcement will be sent separately about the jury and the prizes. The deadline of sending the music is the 30th of January! Please keep an extra CD/pendrive with your music by yourself at the competition. There is no limit of group members in the group categories for the stage of CSILI’s theatre room as it is at least 70 square meters. Of course, the article is not obligatory, but it is very useful to previously know what the jury will take into consideration. - disqualify a contestant any time during the contest if she breaks the rules of the contest or her behaviour harms the reputation of the event, the organizers, partners or sponsors. - The application can be withdrawn and the organizers pay the whole application fee back until the 30th January, 2018. After that date, the organizers are not able to pay the fee back.